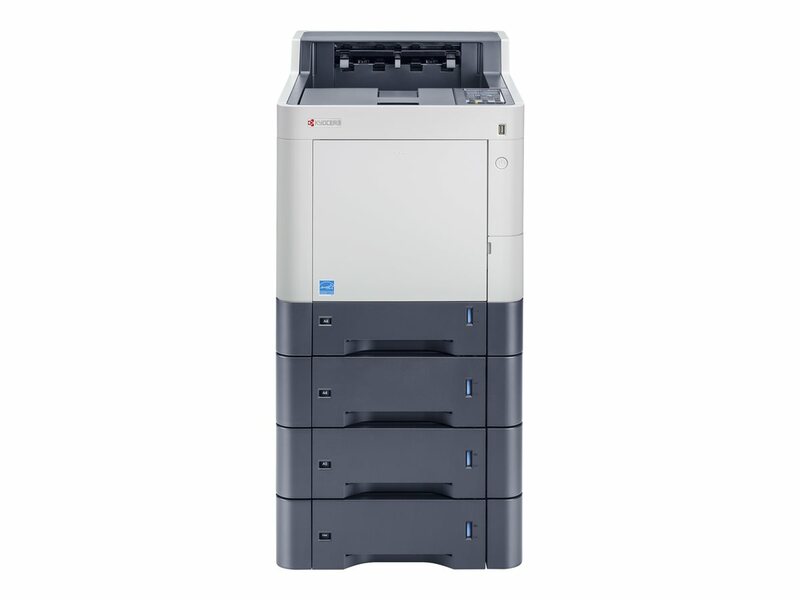 The last single function device we reviewed from this Original Equipment Manufacturer (OEM) was the Kyocera ECOSYS P3060dn – a monochrome printer. This time we’ve set our eyes on the Kyocera ECOSYS P7040cdn, which is also a single function printer. Both devices also sport Kyocera’s proprietary ECOSYS technology, which allows for imaging components to be more durable and reliable. The comparison ends there, though, because this is a significantly more advanced device. The Kyocera ECOSYS P7040cdn is a colour laser printer that offers considerable scalability options and a good feature set. The device is aimed at a wide range of Small to Medium Enterprises (SMEs). Effectively, the device is suitable for both high volume printers and low volume printers. Flexibility and scalability are core strengths of the Kyocera ECOSYS P7040cdn especially since these are qualities that SMEs always look for. The element that depicts these two qualities of the ECOSYS P7040cdn most is its paper handling capacity. 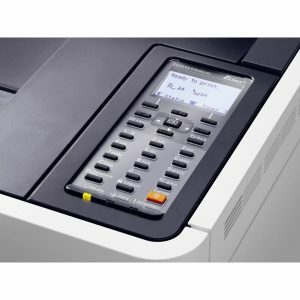 The Kyocera P7040cdn is very versatile with paper handling. The standard variant of this device comes with a paper handling capacity of 600 sheets split between a 500-sheet paper cassette and a 100-sheet multipurpose or bypass tray. However, using optional trays i.e. the Kyocera PF5100 Paper Feeder, this capacity can be increased to as high as 2,100 sheets. This means that the paper handling capacities possible with this device are 600 sheets, 1,100 sheets, 1,600 sheets, and 2,100 sheets. High paper handling capacities are useless unless the print speed of the device matches them. The Kyocera ECOSYS P7040cdn does this. 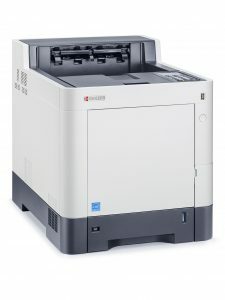 This device is capable of printing at a speed of 40 pages per minute (ppm), regardless of whether you’re printing in colour or black and white. Like the print speed of the printer, its running costs also matter when large volumes of prints are projected. In this sense, the ECOSYS P7040cdn does fairly well as well. How well depends on where you get your cartridges from. If you use OEM cartridges i.e. genuine cartridges, you can expect to spend around 9.3 cents for every page you print. On the other hand, if you use aftermarket cartridges i.e. compatible or generic cartridges, you can bring this cost down to 8.3 cents per page. In terms of the acquisition cost, this printer stays within the acceptable spectrum for its market segment. Its listed price is above $1,800 but if you shop around, you can probably get it for less than $1,500. If cost matters to you significantly, you’ll be glad to know that the Kyocera ECOSYS P7040cdn comes with the automatic feature. This feature allows for double-sided printing which can reduce your paper costs by half. Beware, though, automatic duplexing usually means a reduction of print speed by 50 percent as well. 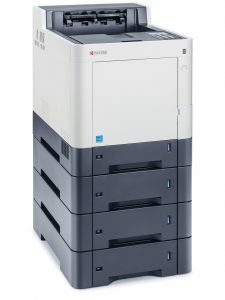 The Kyocera ECOSYS P7040cdn doesn’t have many weaknesses because it doesn’t really try to push the envelope. The mandate for this device’s designers must’ve been to create a device that fits the standard SME needs like a glove but doesn’t offer special features. Despite all that, there are a couple of limitations that the P7040cdn possesses. The foremost of these is within connectivity options. Wireless connectivity isn’t available in the standard variation of the Kyocera ECOSYS P7040cdn. The connectivity options you’ll get with this machine are either USB 2.0 or Ethernet. Wireless connectivity is, however, an add-on that you can go for by paying a little extra. We feel that wireless connectivity should be a standard feature since most businesses have wireless networks these days. It is worth adding that mobile connectivity doesn’t suffer because of the absence of wireless connectivity. The device supports the usual mobile suspects such as Mopria, Google Cloud Print, and Apple Air Print. To get these benefits, you’ll have to make sure that you use the Ethernet port to connect to the printer as opposed to the USB 2.0 port. You could say that print output quality is also a form of limitation with the Kyocera ECOSYS P7040cdn but that is conditional. For instance, if you don’t compare the print output of this device with its competitors, you won’t really know what you’re missing out on. 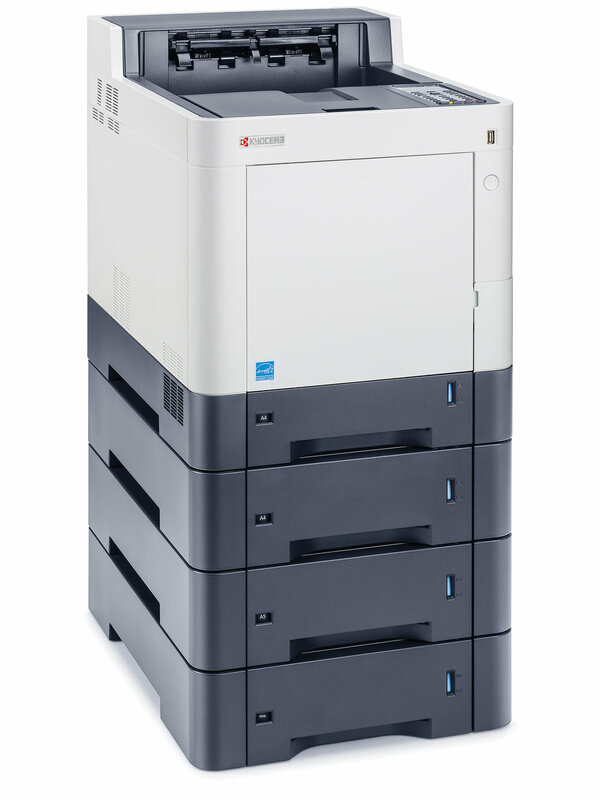 The Kyocera ECOSYS P7040cdn prints well enough for the needs of the usual business. The text output is good, the graphics decent, and photos marginally fine. It is only when we compare it to other devices in the same market segment that the P7040cdn falls short. The maximum resolution that this colour laser printer is capable of is good for its class at 9600 x 600 dots per inch (dpi). The Kyocera ECOSYS P7040cdn is not really a compact device. This is especially true if you go for the paper handling expansion. As it is, this machine measures 469.5mm high, 532mm deep, and 390mm wide. This means that the P7040cdn needs to be treated like a standalone machine. You can’t share a desk with it, particularly since it weighs a hefty 30.5 Kg. All this weight is there because the machine is constructed of materials that are sturdy and durable so it shouldn’t be much of a trade-off for the long-term user. At the heart of the Kyocera ECOSYS P7040cdn, you’ll find a 1GHz PowerPC processor accompanied by a 512MB RAM. While the processor cannot be upgraded, you can boost the RAM to as high as 2GB. These and other components combine to not only give this machine its print speed but also its first-print-out times. From the point of command, you can expect the Kyocera ECOSYS P7040cdn to take about six seconds to spit out a monochrome document and about seven seconds to deliver a colour document. In case you didn’t know, these are respectable speeds. The control panel, even though you won’t use it a lot, consists of a 5-line LCD display screen, a numeric keypad and some buttons. There are a few navigation buttons and some indicator lights as well. While we’ve mentioned the paper handling boosts and the wireless connectivity add-on, there is another way through which you can improve your device. The standard Kyocera ECOSYS P7040cdn doesn’t come with a hard disk drive but the OEM has provided for its inclusion. You can opt-in for either a 32GB SSD or a 128GB hard drive if your needs demand it. The use of the ECOSYS technology means that the drum of the P7040cdn is especially durable. It will last you for 300,000 pages. This, incidentally, is one of the warranty stipulations. The Kyocera ECOSYS P7040cdn comes with a 24-month onsite or 300,000 pages warranty, whichever comes first.